Concert hall, built 1891 as "Tonhalle" by Joze Platner on the former site of the "Slovensko narodno gledalisce" (destroyed by fire in 1887). Later renamed "Slovenska filharmonija". Home to the "Slovenska filharmonija" orchestra. Velika Dvorana [Great Hall]: Opened 25 Oct 1891 with a gala concert. 1937 renovations and addition of a balcony. 2001 major renovations. Re-opened 25 Sep 2001. Installation of a concert organ (inaugurated 8 Jan 2003). Used for symphonic concerts. Ca. 500 seats. Mala Dvorana [Small Hall]: Used for chamber concerts. Up to 100 seats. 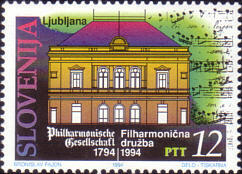 Text: "Ljubljana - Philharmonische Gesellschaft - Filharmonicna druzba - 1794-1994"